It might help you to think differently about the world. For the world to tackle truly important problems, people have to stop looking to religion to guide their moral compasses, the philosopher Sam Harris told CNN. It should all burn to the ground. It could not possibly be clearer that God is imaginary. PS – And Islam is even worse. Why would anyone believe in a “god” whose church is so disgusting? As Germany–the pope’s own homeland–continues to be rocked by allegations of priestly abuse, many are wondering how high the scandal will go–after all, Pope Benedict XVI himself, as archbishop of Munich, approved an abuser’s therapy treatment without reporting it to authorities, though he claims not to have known about the abuse. Meanwhile, the pope’s attempt to put out a similar fire in Ireland with a letter this past weekend is stirring mixed reactions. If there actually were a God, why would he stand by silently as all of this crap happened in his own church? Obviously he would not. It is the easiest way to see that God is imaginary. Someone will pull out the old “free will” excuse. But you can’t have it both ways: God cannot both “respect free will” and “answer prayers”. If he intervenes to answer prayers, then he would also intervene to eliminate crap in his church. Someone else will say, “The Christian God doesn’t answer prayers.” That is both a contradiction of the Bible and a contradiction of the beliefs of billions of Christians. It also means God does not interact with our universe, meaning that he is imaginary. If you are a Christian and you are tired of all the crap in your religion, try reading: Whywontgodhealamputees.com . Give up your imaginary God and join reality. You will be glad you did. Why do Christians fanatically stick by such scumbags? It is no secret that I do not hold Sean Hannity in very high regard. He is a man who stares into a camera and speaks into a microphone and lies. He does this for the sole purpose of increasing his ratings and income while scaring the hell out of his believing audience as he purposely misleads them. Indeed, so believing is his audience, I would bet the farm that they will give Hannity a pass on this entire scandal. He is right – they will give Hannity a pass. But why would they give Hannity a pass on such egregious, repulsive behavior? Why did they give Limbaugh a pass on his drug addiction, when they believe drug addicts should be jailed? Why do they give Sarah Palin a pass on all of her lies and misdeeds? Why would they want to have anything to do with a “god” that kills millions of children himself and demands the death of millions more innocent people? It is bizarre, pathological behavior. Beck has millions of followers who say he is right. Other evangelical leaders have millions of followers who say they are right. The fact is that there are hundreds of debates like this in Christianity. Example: Millions of Christians believe homosexuals should die, while millions more believe they should be forgiven. Example: Millions of Christians believe that women should be submissive to men, while millions more believe that women should be ordained priests. Etc., etc. The fact that there are all of these schisms in Christianity proves that there is no God. For if there actually were a God, the answer to every question about God and Christianity would be crystal clear. God would say which side is right in every debate. There would be no confusion, no questions. The fact that all these fundamental questions can have any debate proves that God is imaginary. Christians: why is there so much child abuse in your religion? The following video demonstrates a strange side of Christianity – its tendency toward child abuse. Why would Christians have this tendency? The use of corporal punishment also extracts a huge toll on our children’s health. In the most comprehensive report to date on child abuse, a fifteen-member board of experts, appointed by the department of Health and Human Services, compiled statistics on child abuse deaths and injuries. It was commissioned by the United States Advisory Board on Child Abuse and Neglect. The 248-page report, entitled, “A national shame: Fatal Child Abuse and Neglect in the United States” concluded that over 2,000 children are killed each year by their caretakers (Cavalier, 1995). It found that “more preschool children are killed by their parents than die from falls, choking, suffocation, drowning or fires (p.34).” In addition, 18,000 children are permanently disabled and another 142,000 are seriously injured by their caretakers each year. These are shocking statistics. Marjoe (named after Mary and Joseph) was born in 1944 to Pentecostal preacher parents. His father, grandfather, and great-grandfather were also evangelists and his parents noticed early in his life that he had a precocious self-confidence and good mimicry skills. They had the idea of making him a child preacher, publicizing a story of him at the age of three being visited by the Holy Ghost and speaking in tongues while having a bath. It turns out the whole thing was a giant con, like all religion. If you are religious and you wish to understand how badly you are being conned by your religion, here is your chance to understand. This appears to be an insane, biblically-based hatred by Christians. If it is not, what is it? The prom’s off at a northern Mississippi school after a lesbian student demanded she be allowed to bring her girlfriend. The American Civil Liberties Union had demanded that the Itawamba County school district allow 18-year-old Constance McMillen to attend with her date. A school board statement Wednesday announced the district wouldn’t host the April 2 prom at Itawamba County Agricultural High School. Why to Christians hate people of the homosexual persuasion? Why would Christians hate anyone? If you want to help make it known that the world is full of people who are ‘good without God’ and who don’t need religion to influence their lives, then on Mon, 29 Mar ’10 join in and set the letter ‘A’ graphic to be your Facebook profile photo. As the ‘A’ appears all across the site let’s see how much interest we can generate during the week – have fun! In view of the fact that in most of history the Jewish people and Jews have been severely persecuted and harassed, first and foremost by Christians and persons raised as Christians – who often justified their actions with the same Bible revered by their victims –, it is almost surprising how much Jewish apologetics resemble those promoted by Christian theologians. What is presented to the reader as the essential message of Jewish morality is largely a projection of modern, humane and humanistic values on the Scriptural texts, which are quoted very selectively. Like any human product the Sacred Scriptures – as a reflection of the thoughts and environment of their authors – contain both agreeable as well as problematic teachings and morals. Modern theologians consider largely only those verses which do not seem offensive in the light of today’s ethics and value systems, which mainly derive from the era of enlightenment, occasionally even from ancient pagan sources, or are simply values which can be shown to be the basis of many, in other respects vastly different cultures. These selected verses then are claimed to be the essential message of the Sacred text and the religion based upon it, although in many cases the very next verse directly contradicts this picture. Christians, your religion does not want you to think. Think about it. 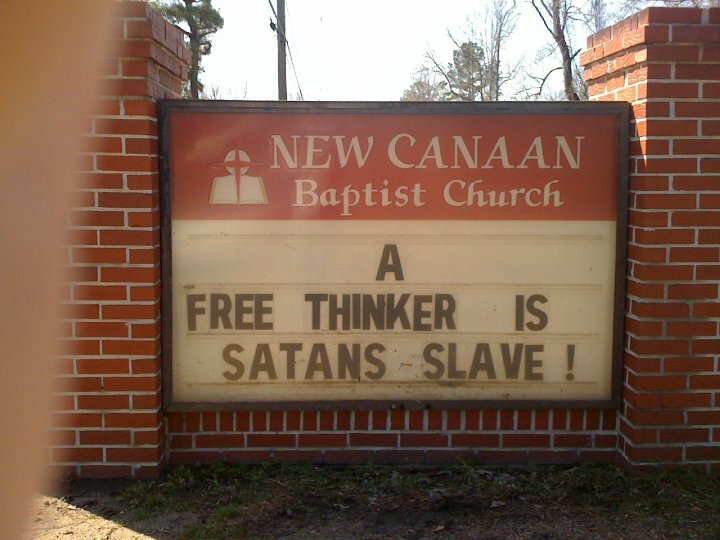 A free thinker is satan’s slave! According to your religion, if you think for yourself, you are evil incarnate. Why would you want to be a part of this? Nothing more is needed to prove that God is imaginary. 1) CBS affiliate CBS13 reports that Roy Ashburn, a married, Republican state senator from Southern California WITH A HISTORY OF OPPOSING GAY RIGHTS was arrested for allegedly driving drunk after leaving a gay bar with another man in the car.